In 1994 four urban designers were invited to develop a scenario for the centre of Almere. 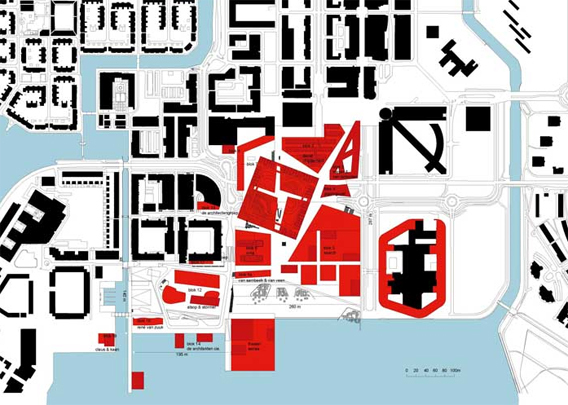 The metropolitan approach taken by Rem Koolhaas's OMA with its multiple land use was the one chosen. The given programme is concentrated in megastructures: a business centre near the station and a mix of cultural amenities, shops and housing along the water. All components were fleshed out by international architects of repute. On the waterfront can be found housing by Claus & Kaan (Silverline), René van Zuuk (The Wave) and de Architekten Cie. (Side by Side) as well as Sanaa's theatre complex. William Alsop designed an Urban Entertainment Centre of shops, a hotel, and a blob-like pop/rock venue which has since been recast as a discotheque. OMA were responsible for the parking facility.